Use the Smoking Gun and the Chamber Vacuum Sealers from Poly Science to create this dish. Set the rear flow adjustment slider of the Sous Vide Professional™ to fully closed and the front flow adjustment slider to the maximum flow to ensure proper circulation. Set the temperature of the Sous Vide Professional™ to 160°F / 71°C. Place sliced pineapple into vacuum bag. Place vacuum bag into chamber vacuum sealer and pull a full, 100% vacuum on the pineapple. Once water bath has reached 160°F / 71°C, place vacuum sealed pineapple in water bath and cook for 15 minutes. Remove from bag and let drain on a paper towel. Place skewers through the pineapple, lengthwise, creating a lollipop. Spread turbinado sugar onto a plate. Press one side of each skewer of pineapple into the sugar, coating evenly. Brûlée the sugar evenly with sugar torch. Set aside to cool. Place graham cracker crumbs on bottom of mason jar or plate. Scoop 1 quenelle vanilla ice cream and 1 quenelle mango ice cream and place atop graham cracker crumbs. 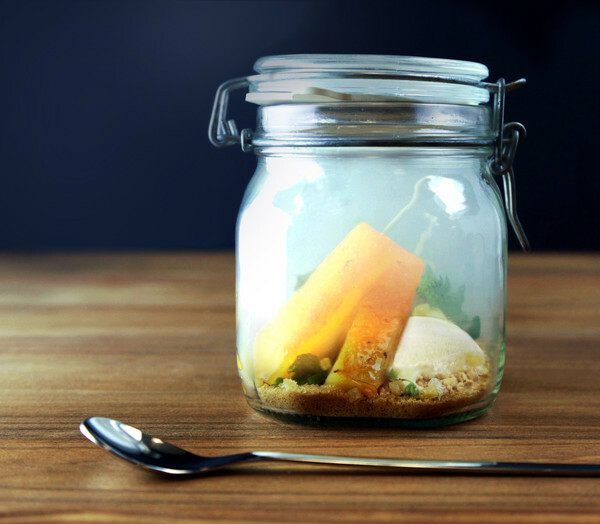 Place brûléed pineapple skewers inside jar or on plate and garnish with crystallized ginger, mint, basil and cilantro. Fill jar (or cover plate with salad bowl) with dense apple wood smoke from the PolyScience Smoking Gun™. Seal until presentation.